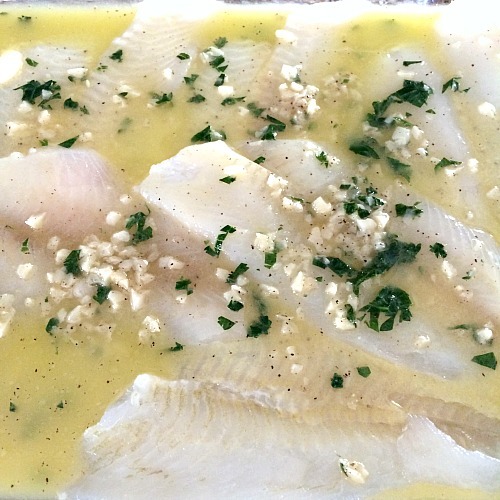 This Baked Flounder with Lemon Garlic Butter is quick and easy to make, and great for grown-ups and kids. Ready in less than 20 minutes, with little work, it’s the perfect weeknight dinner for the busy holiday season. I can’t believe it’s November already. I’m not mentally prepared for the holiday season. Do I say that every year? I feel like I do. With the holiday season comes a lot of running around in the evenings after work and school, and this year we have vocal and theater lessons for our daughter on top of everything else. Even though I should know better by now, I’m still not great at making quick and easy dinner recipes that aren’t just spaghetti or tacos. Except, one of our favorites is baked fish recipes with lemon and butter. Sometimes I add garlic, or paprika, or Italian seasoning, and the type of fish changes, but the lemon butter base is always the same. Start by preheating your oven to 400 degrees. 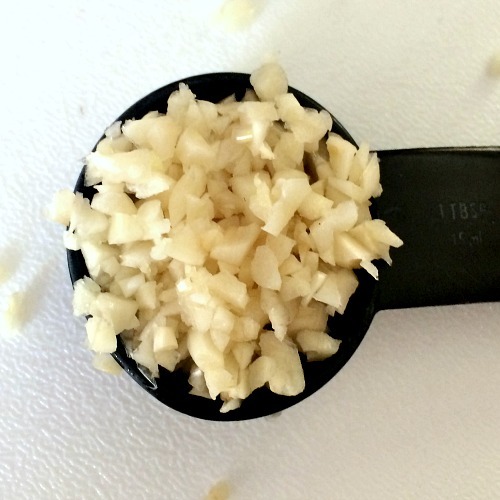 Mince a tablespoon of garlic. Combine butter, lemon juice, chopped parsley, the garlic, and black pepper in a microwave safe cup or bowl. Melt the butter in the microwave for 30 seconds, stir, and microwave again for 30 seconds. Stir and check that the butter is completely melted. I thought I took pictures of this process, but they seem to have disappeared! If you don’t have a microwave, melted the butter with the garlic mixture over low heat in a small pan on the stove. 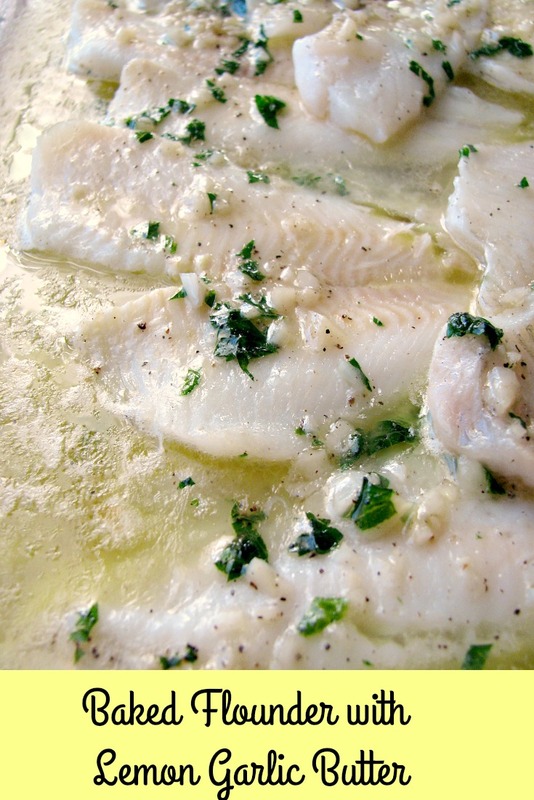 Pat flounder fillets dry with paper towels and place in a glass baking dish. Pour the melted butter mixture over the flounder. Bake in the preheated oven for 12-20 minutes, depending on the thickness of the flounder fillets. Serve with rice and a vegetable for a complete meal. 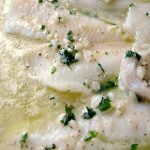 This Baked Flounder with Lemon Garlic Butter is quick and easy to make, and great for grown-ups and kids. Ready in less than 20 minutes, with little work, it's the perfect weeknight dinner for the busy holiday season. Combine butter, lemon juice, chopped parsley, minced garlic, and black pepper in a microwave safe cup or bowl. Melt the butter for 30 seconds, stir, and microwave again for 30 seconds. Stir and check that the butter is completely melted. Alternately, melt the butter mixture in a small pan over low heat on the stove. Bake in the preheated oven for 12-20 minutes, depending on the thickness of the flounder fillets. Serve with rice and veggies, if desired.